Paterson is out on DVD on 27th March and to celebrate we have a great competition for you and 2 copies of the DVD to give away. Drama written and directed by Jim Jarmusch. The film follows Paterson (Adam Driver), a New Jersey bus driver with a hidden talent for writing poetry. Following the same routine each day, Paterson uses his observations while driving as inspiration for his writing. 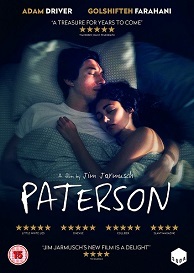 With his quirky and ambitious wife Laura (Golshifteh Farahani) pushing him to publish his work, Paterson is reluctant to make any change to his comfortable and serene world. The cast also includes Barry Shabaka Henley and Chasten Harmon.